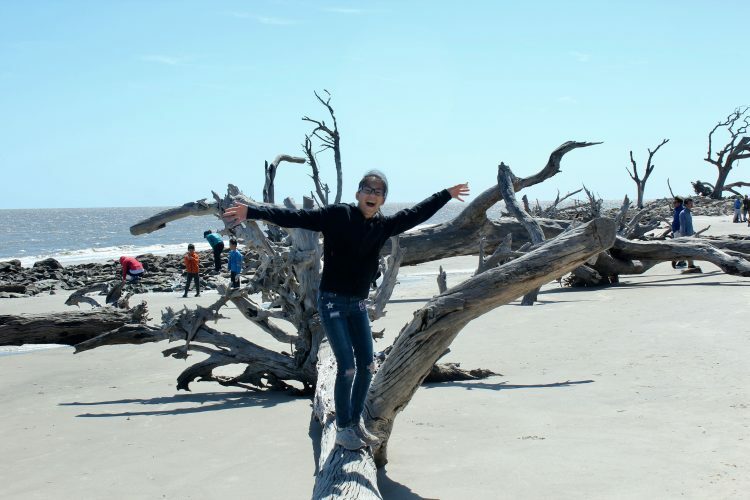 Home » Destinations » Magical Driftwood Beach: A must see! 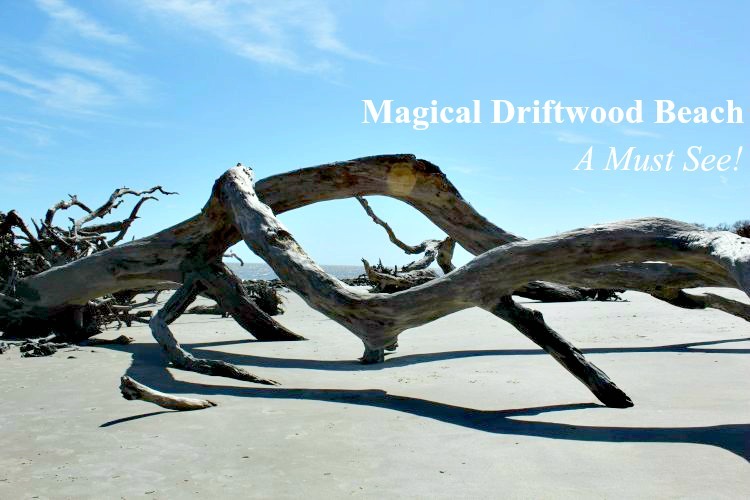 Magical Driftwood Beach: A must see! I grew up just a few houses away from my elementary school. In summer, my friends and I spent countless hours climbing the jungle gym. Some days we became Olympic gymnasts — winning the gold, of course. Other days, we’d climb to the tippy top (not allowed during school recess), hang upside down and talk the day away. So carefree. I haven’t thought about those days in a really long time. Fast forward a few decades to my 51st birthday. 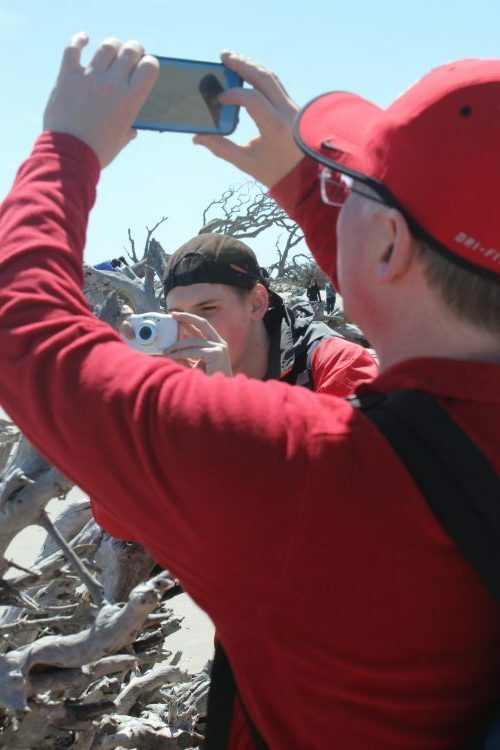 We celebrated my birthday weekend at Jekyll Island, one of Georgia’s Golden Isles. Renting bikes for the day, we pedaled up the northeastern side of the island toward Driftwood Beach. First off, no-see-ums are ferocious along the coast. Rob and Ben, wearing shorts, made the perfect brunch. And the wind, blowing in from the north with a rapidly approaching cold front, made our efforts so much harder. With the goal in mind, no bitty bug or pushy wind would deter us. We pedaled. We pushed. We stopped for water. It was tough, y’all. Okay, totally funny moment. We missed the sign for Driftwood Beach (it’s not very big) and actually pedaled to the far north path. GROAN! 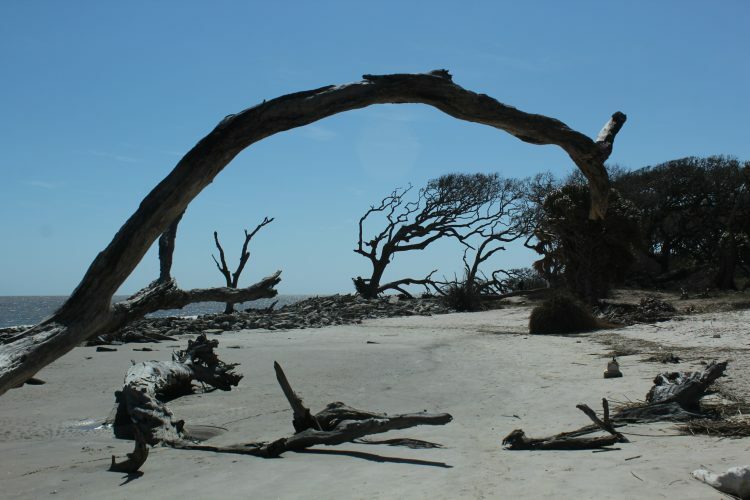 We walked the bikes down the sandy trail between palmetto trees, excitement building. Through an opening in the trees, we caught our first glimpse of Driftwood Beach. Fatigue forgotten, we tucked the bikes between the palms and ran out to the beach. Looking out toward the Atlantic, tree trunks, polished smooth by decades of salt water scrubs and baking sun, lay this way and that. A childlike glee washed over me and a squeal may have escaped my lips. A few squeals, really. After that initial moment, I looked north and south. It was like stepping into another world. The photos online are cool, but nothing like seeing it in person. Driftwood Beach stretches a couple football fields long north and south. 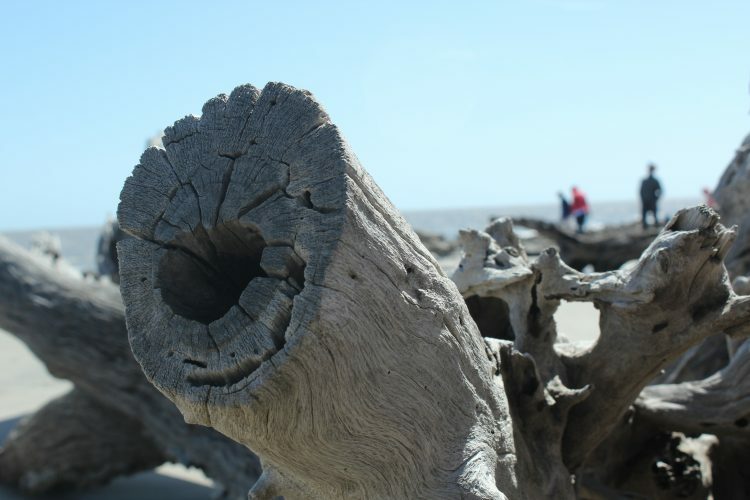 Gnarled, silver tree trunks stretch across the sand begging for photos. Roots stand, tall and proud, inviting climbers. Ben ran north up the beach. Ellie ran straight to the closest fallen tree with Rob and tried to climb. She was timid, at first. The wind was fierce up on that tree. My itty bitty just didn’t have the mass to fight it like us big people. Ellie’s a tough cookie, though, and fought the wind. Ellie won. The playground was hers to explore. In that moment, I finally understood my feelings since stepping through the trees. 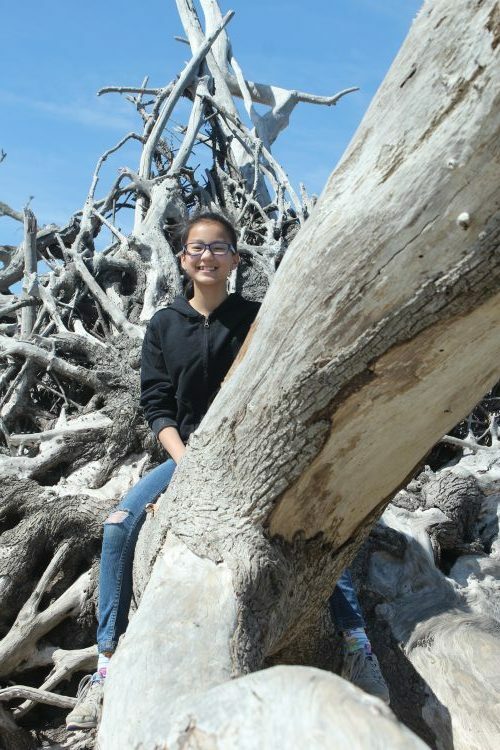 Somehow, this massive playground of long dead trees had transported me back to the playground days Of my childhood. I was a little girl again, free from the constraints of common sense and expectations. Uncontainable smiles reflected the excitement bubbling through me. 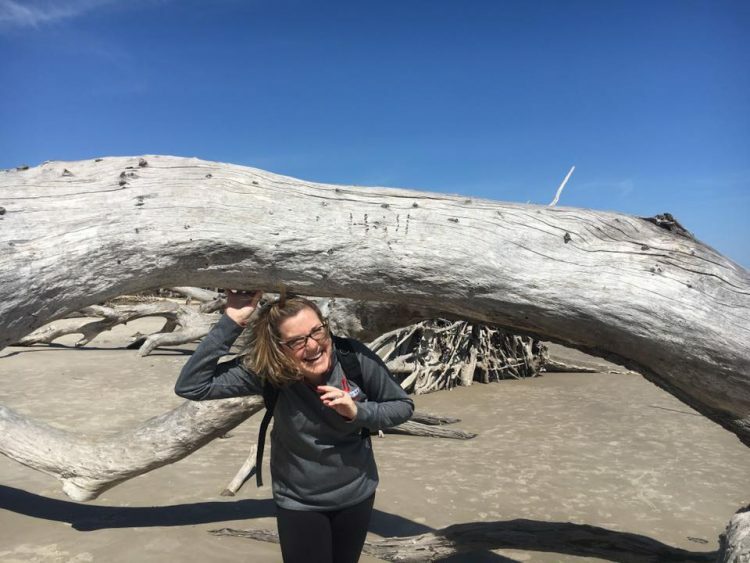 We could have spent the whole day at Driftwood Beach, scrabbling up tree trunks to test our climbing skills and find new vantage points, but our bellies reminded us that it was lunchtime. Reluctantly, we pulled each other away from the trees, sneaking “just one more picture” a few dozen times, to bike back down the beach, the wind at our backs pushing us along to lunch. 4. Visit during low tide — otherwise this playground is under water! 5. Make sure your camera is fully charged!